In anticipation of the release of Bulldozer AMD flew a select few press down to Austin Texas for an editor’s or tech day to witness Bulldozer in action and watch them attempt to break the previous world record for highest frequency CPU. Typically a tech day is held just before any major release of a product or architecture and serves the purpose of the editors and major websites getting a firsthand look ahead of the release. We are able to sit with developers and product managers to ask questions and in return be asked questions. True to form the tech day just two weeks ago heralded the approach of the new Bulldozer architecture from AMD and while I am still unable to talk about most of what we saw that day we can talk about the potential to overclock this new chip. AMD has described the chip we saw overclocked as “near production level”. I’m not quite sure if that means we were watching a true representation of what retail Bulldozers are capable of as these could have been “cherry picked” chips . . . or I could be reading into the press release too much. Without further ado lets look at what the Bulldozer is capable of from an overclocking standpoint. We watched as several trays of Bulldozer CPU’s were brought out and tested by two of the best overclockers in the world. While we are still under NDA for much of what we witnessed at the event we have been given the green light to bring you the following video and photo coverage that we took while there. Don’t Try this at Home Kids You are Likely to Freeze off Something You will Need Later. More details can be found on AMD’s Blog about the Guinness Book of World Records release. 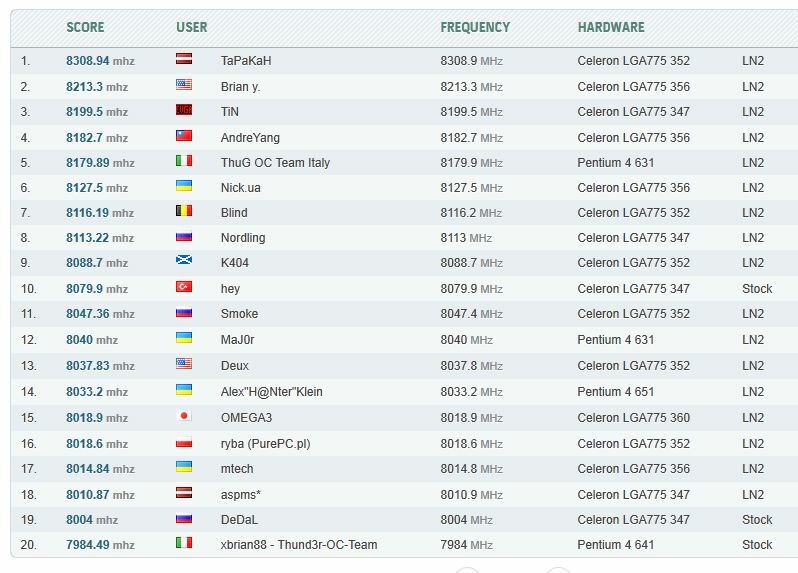 The previous official #1 spot was held by a Latvia user named TaPaKaH. The full listing of the top 20 can be seen here. The overclocking validation can be seen here. As you can see the entire top 20 list is held by Intel. But if you look you will see a trend, most of the top twenty consist of Intel Celeron single core CPU’s. It is notably easier to overclock a single core CPU than it is a multi core CPU like the Bulldozer. We watched as a pair (2 cores) of AMD Bulldozer cores were pushed to 8.429GHz!!! This of course not only sets the bar high for Intel but also overclockers worldwide, it sets the standard for overclocking by 119.44MHz. frequencies well above 5GHz using only air or sub-$100 water cooling solutions. of our upcoming AMD FX processors. Processor,” by overclocking the upcoming 8-core AMD FX desktop processor. named in the Guinness World Records. Check out our Huge Gallery of Inside Secret Images Next. As soon as this processor is released to the market, rest assured we will Have the full gambit to see what this baby can really do unleashed. Any specific requests?